It was a brutally hot and humid day in the nation’s capital and Margie Mathers needed a cane to get up to the podium, but the Florida senior had a story she was determined to tell. 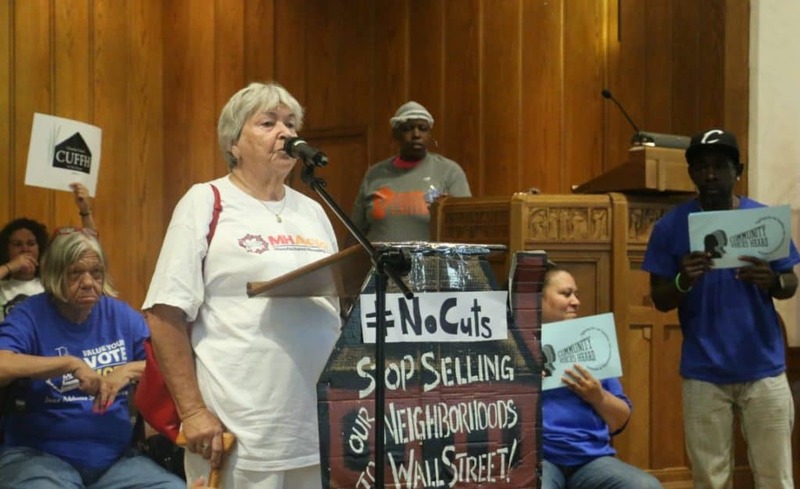 “When I moved into our manufactured housing community in North Fort Myers, it was a beautiful, peaceful place,” Mathers told the crowd of around 1,000 activists who’d converged on the city for a July 13 Tenant March on Washington. What changed? Her development had been purchased Equity LifeStyles Property Inc., a private equity firm specializing in developments where residents own their trailer homes but rent the land under them. This new landlord quickly jacked up Mathers’ monthly rent to $630, from $230 just four years ago. To fight back, Mathers became involved with MH Action, which is organizing owners of manufactured home to protect the affordability and quality of their communities. This group co-sponsored the Tenant March, along with more than a dozen others, including New York Communities for Change, Community Voices Heard, People’s Action, CASA de Maryland, and the Center for Popular Democracy. Organizers reported that marchers came from 16 different states. A core goal of the protest was to draw attention to the fact that while Republicans are proposing severe cuts to housing assistance, they are continuing to support subsidies for private equity firms that are squeezing low-income tenants around the country. President Trump’s proposed budget would cut $7.4 billion in housing funding by eliminating housing vouchers, cutting public housing funding by $1.8 billion, and significantly reducing homeless assistance grants. While stripping support for low-income Americans, the budget would maintain programs that help fill the pockets of wealthy investors. The biggest private equity player in the housing market is Blackstone, which has become the country’s largest landlord, owning more than $102 billion in real estate. Speaking at the rally, Senator Elizabeth Warren (D-Mass.) blasted the administration for backing a $1 billion loan to Blackstone to buy public housing. 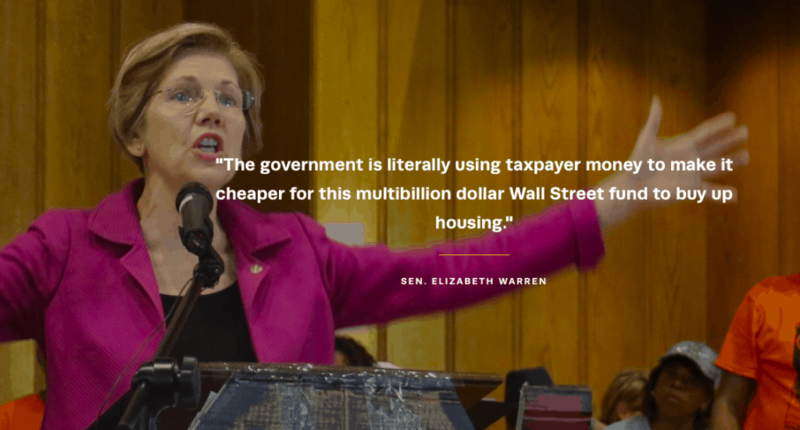 “The government is literally using taxpayer money to make it cheaper for this multi-billion dollar Wall Street fund to buy up housing,” Warren said. Such loan guarantees and other taxpayer-subsidized perks for private equity housing investors would continue under the White House budget plan. This is hardly surprising, given the influence of Blackstone CEO Stephen Schwarzman, who has a personal net worth of $12.5 billion. He currently chairs Trump’s Strategic and Policy Forum and is a close personal advisor to the president. According to Politico, the two sometimes speak on the phone several times a week. After the kickoff rally, marchers carried out a “die-in” at the Department of Housing and Urban Development (HUD) and ended the day with a protest outside a luxury condo building owned by Blackstone. Marchers vowed to keep up the fight to make affordable housing a right, despite the formidable forces against them. Omar Taylor told the crowd an encouraging story about his own battle against a giant private rental property owner in Oakland who’d evicted his aunt after a foreclosure auction. With the support of the Alliance of Californians for Community Empowerment (ACCE) Action, he was able to mobilize enough pressure on the landlord to negotiate a deal so that his aunt could move back into the home that had been in their family for 40 years.